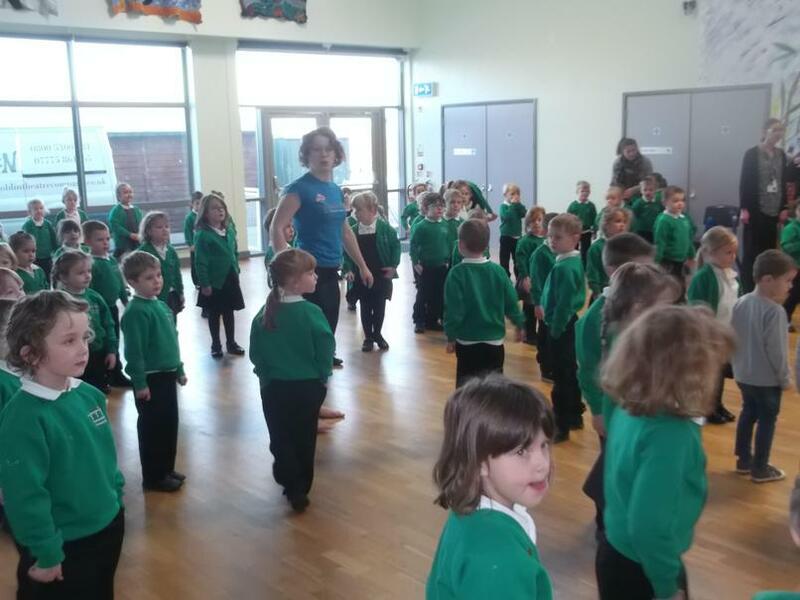 What a busy time it has been for all your children, they have been learning lots of new things everyday and have risen to the challenge of their first term at school. 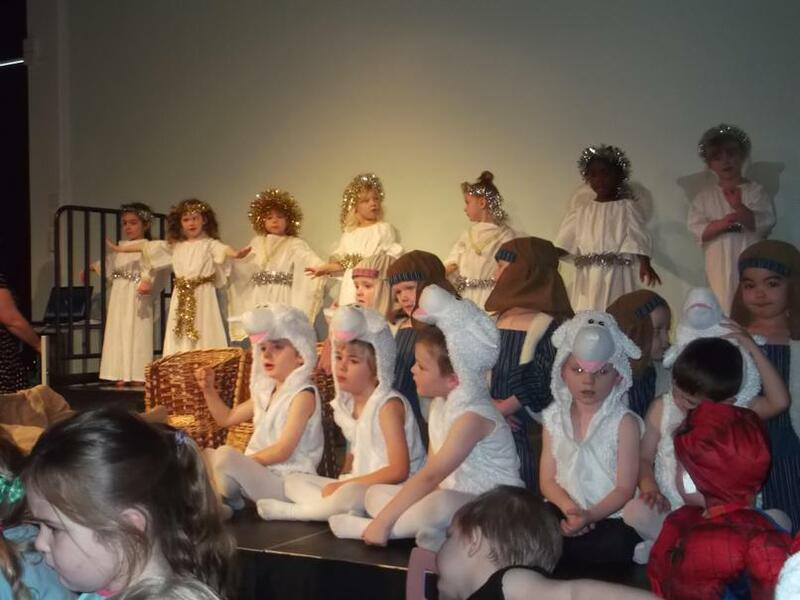 We have been having lots of fun recently rehearsing for our Christmas concert. 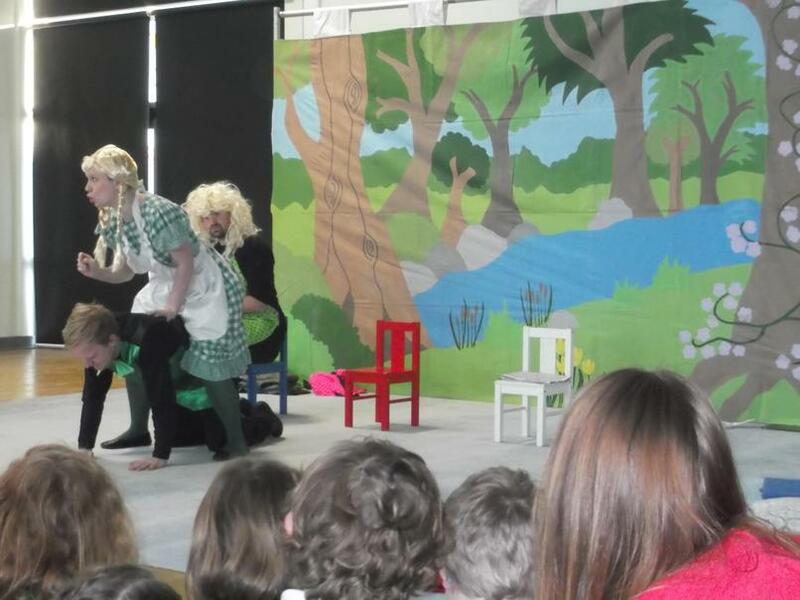 I hope you can come to watch but here are some photographs just in case you can't make it. 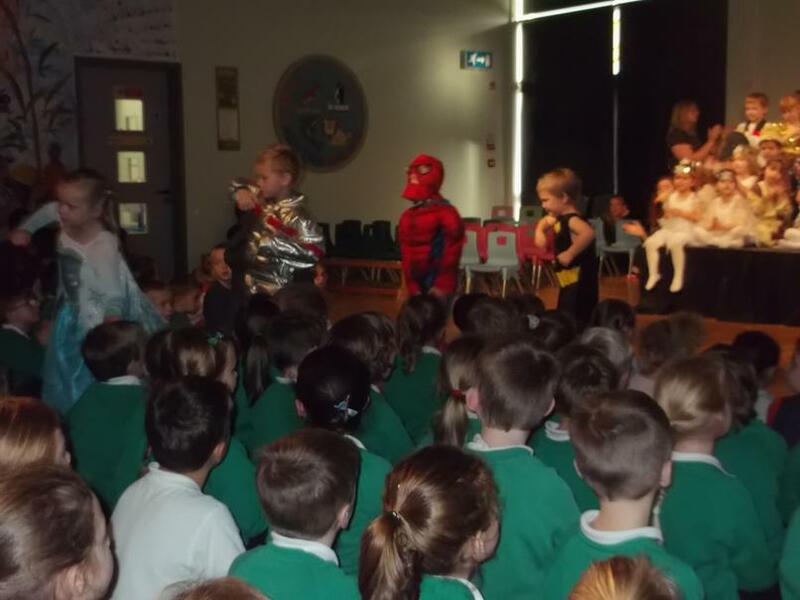 We have had a fantastic start to the year with lots of exciting activities in our classes. 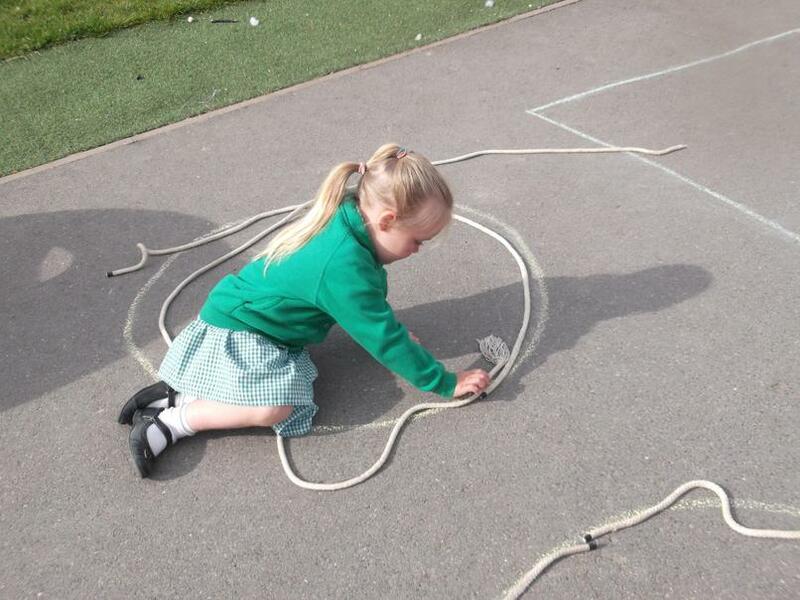 Here is some of the fun learning we have been enjoying. 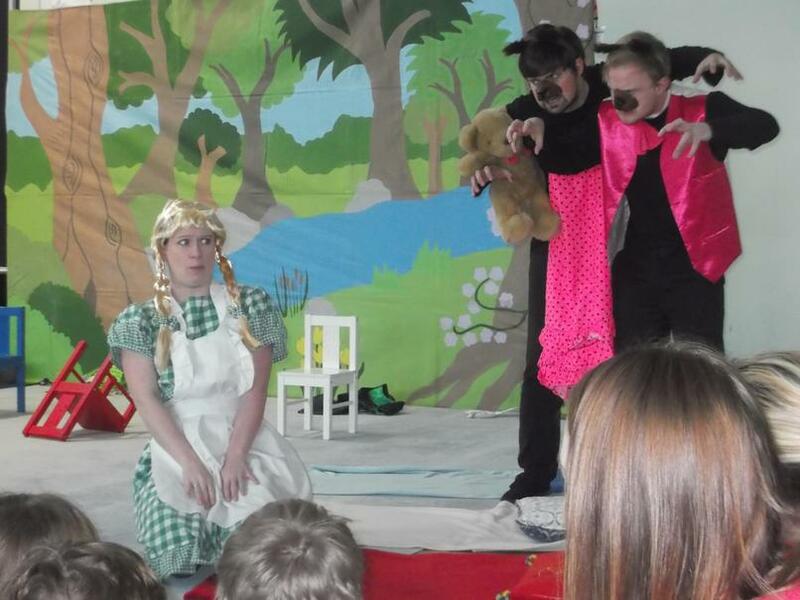 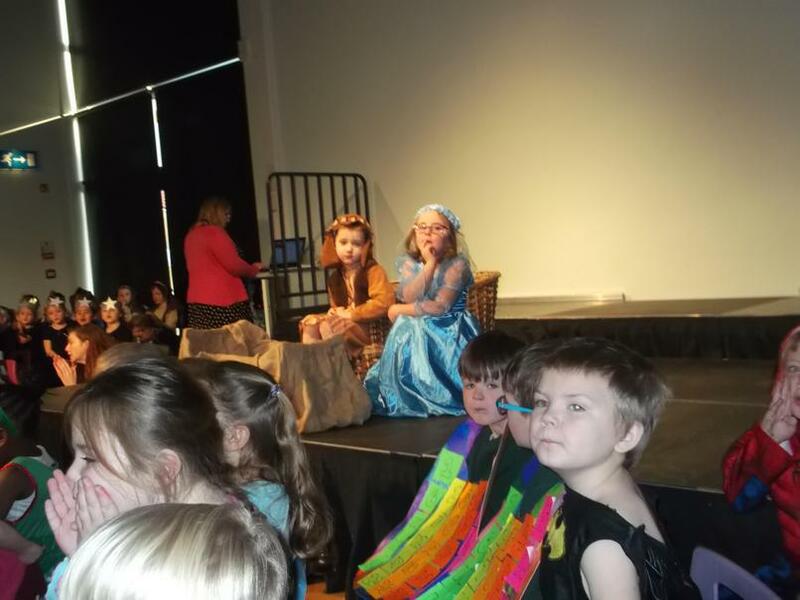 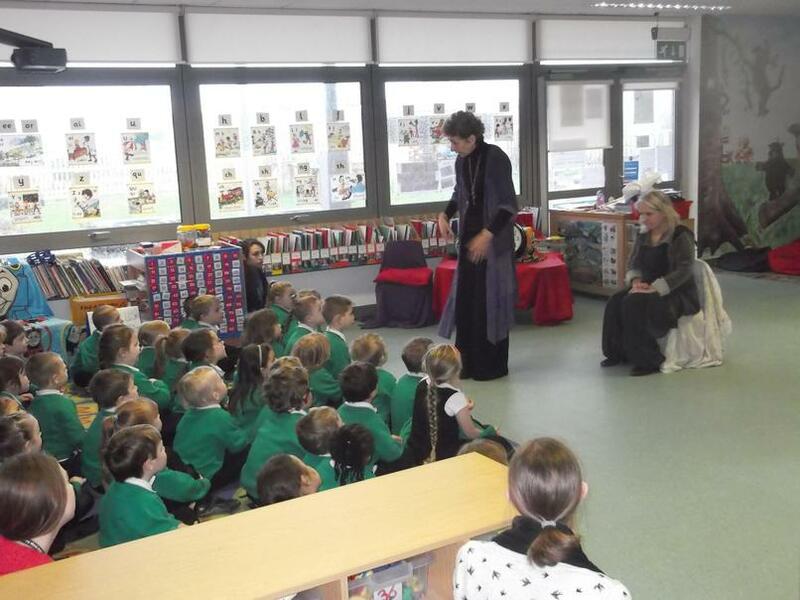 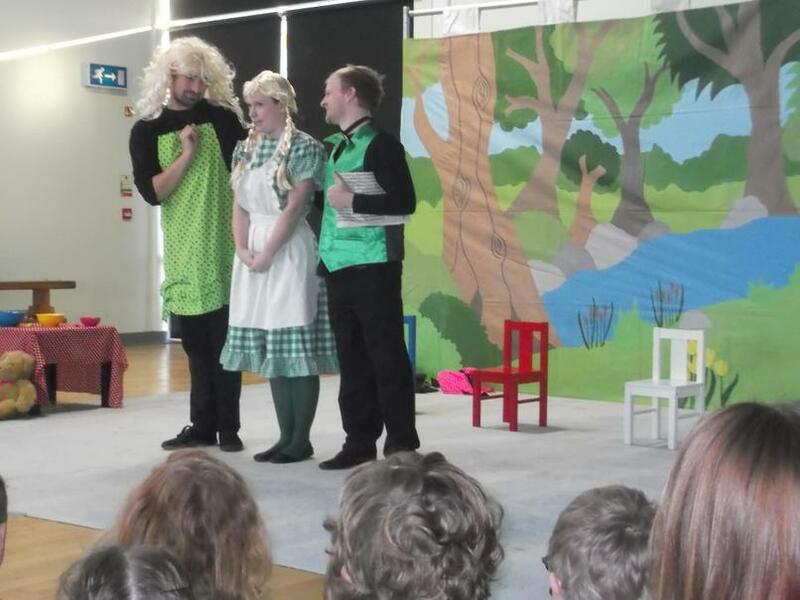 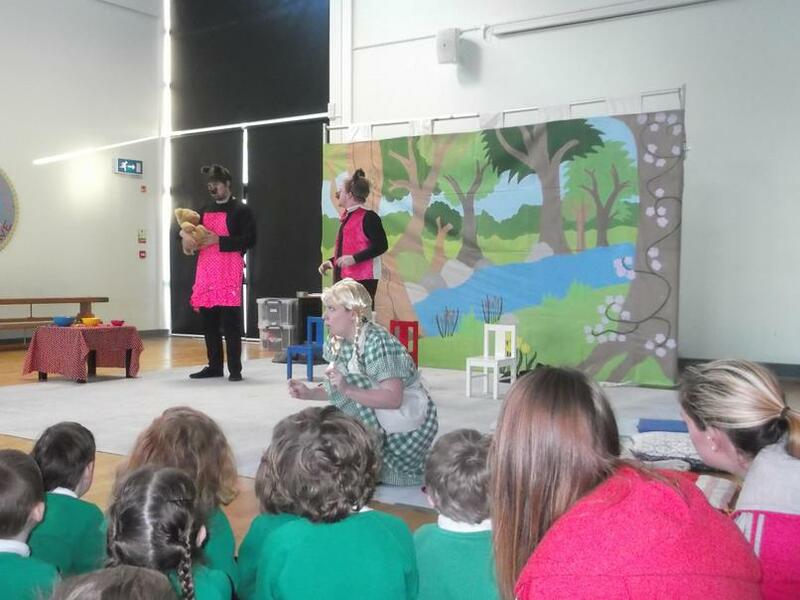 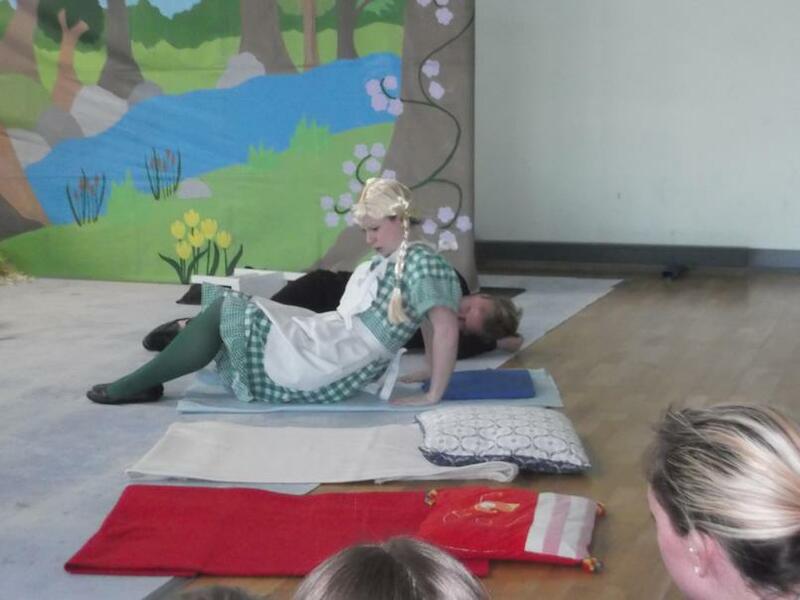 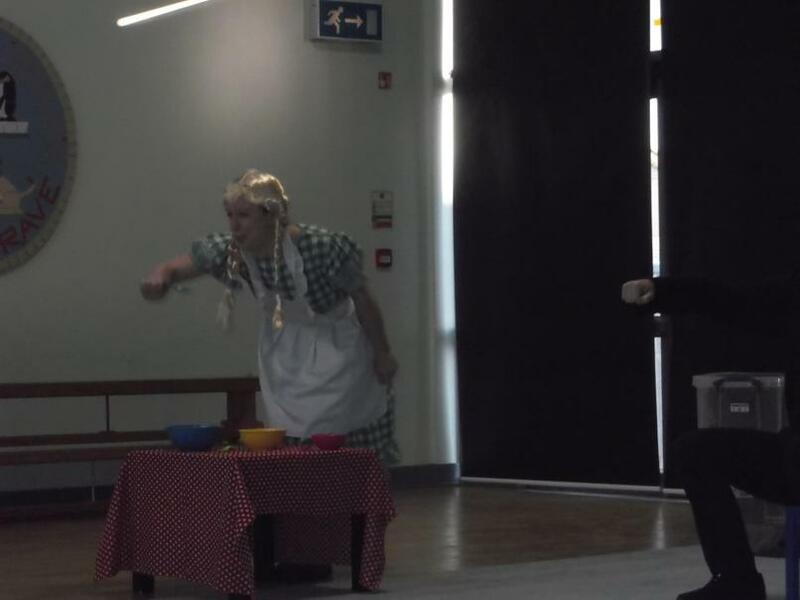 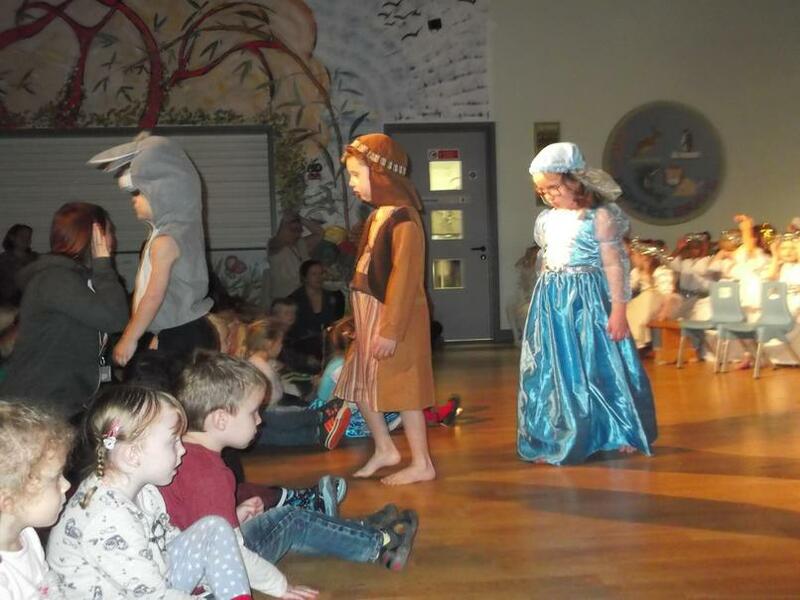 The Hobgoblin Theatre Company came to visit us in January and performed 'Goldilocks and the Three Bears'. 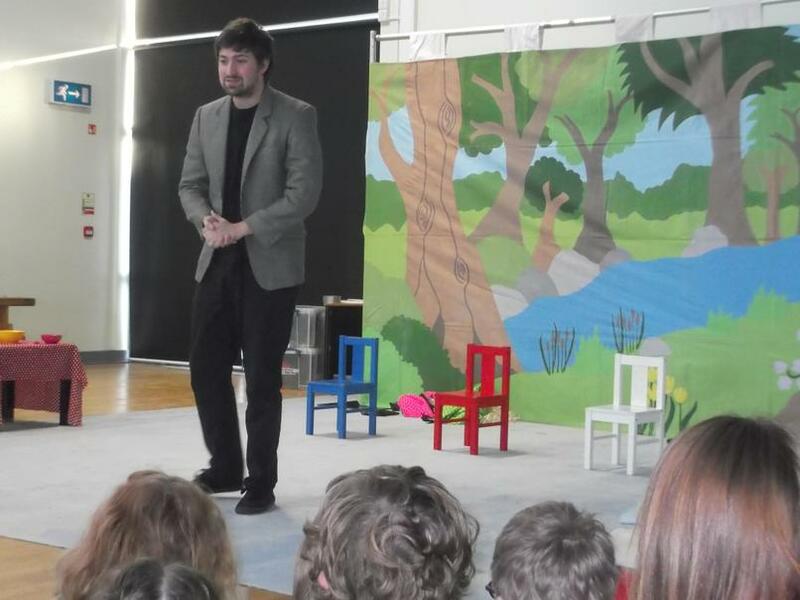 After the performance we had fun with the actors at a workshop where we learned about how to be a character from a story. 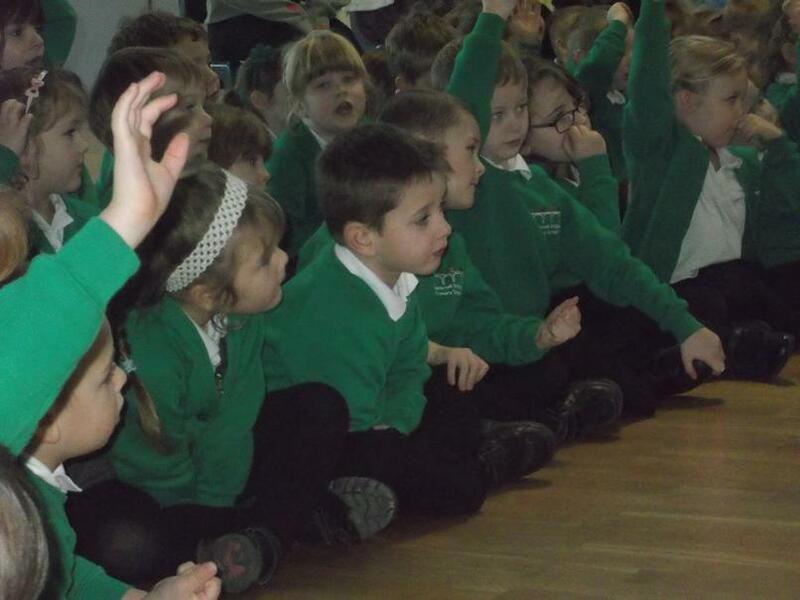 We have been thinking carefully about how we learn the best and how we can try to be successful learners. 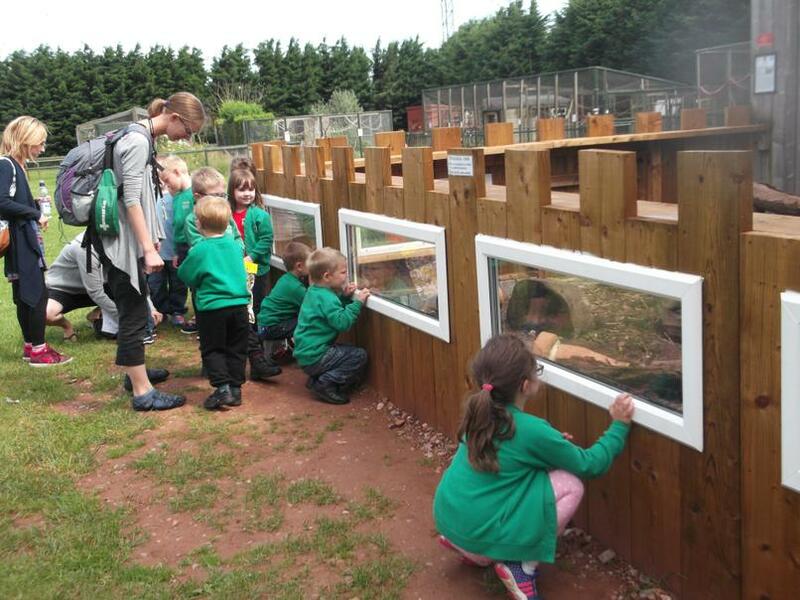 Please come into our class to look at our class caterpillar. 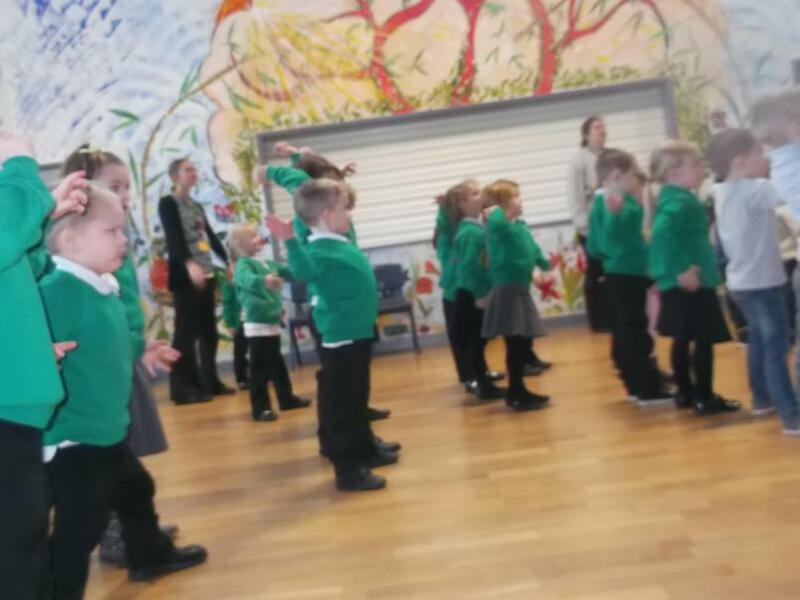 He tells everyone about 'Good listening', 'Good looking', 'Good sharing', 'Good turn taking' and 'Good trying' this is how we learn the best! 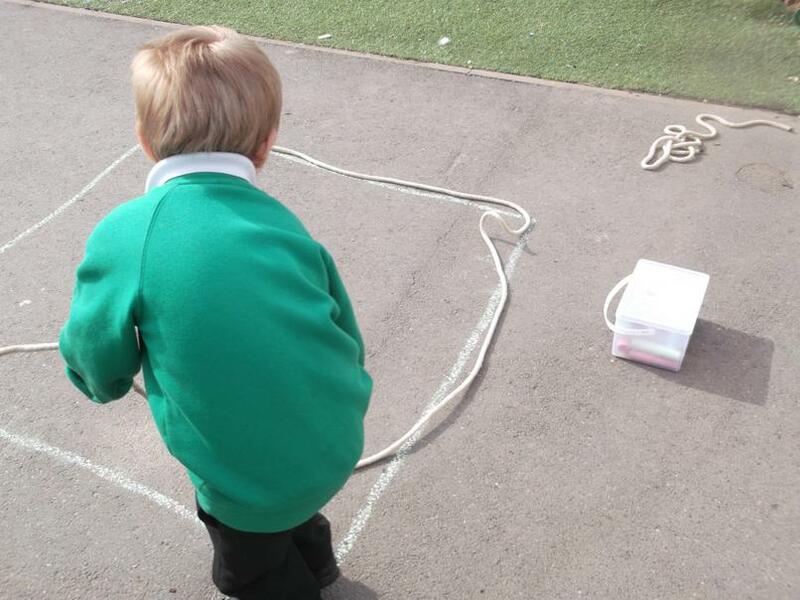 What a busy time we've had measuring our classroom! 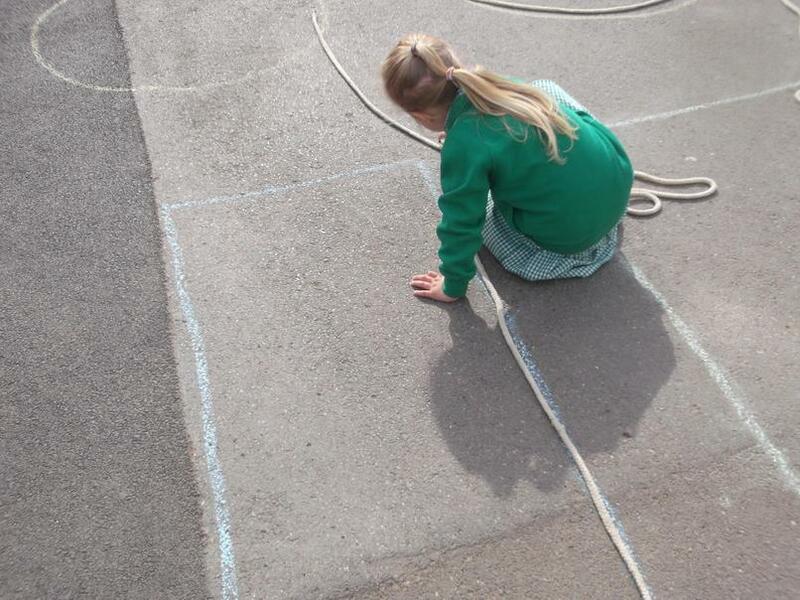 We used rulers to measure all sorts of different things - including ourselves! 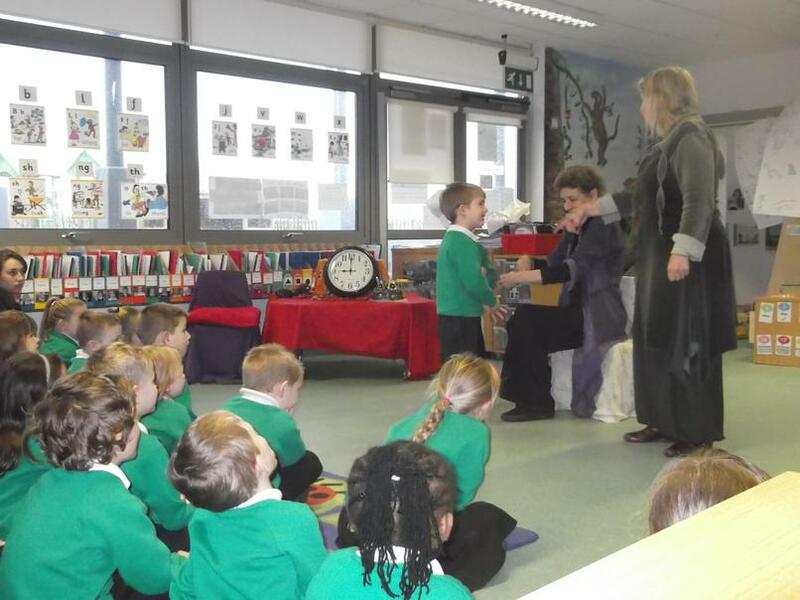 We have learnt a new story this term, Jack and his adventures have been interesting to listen to and also to write about! 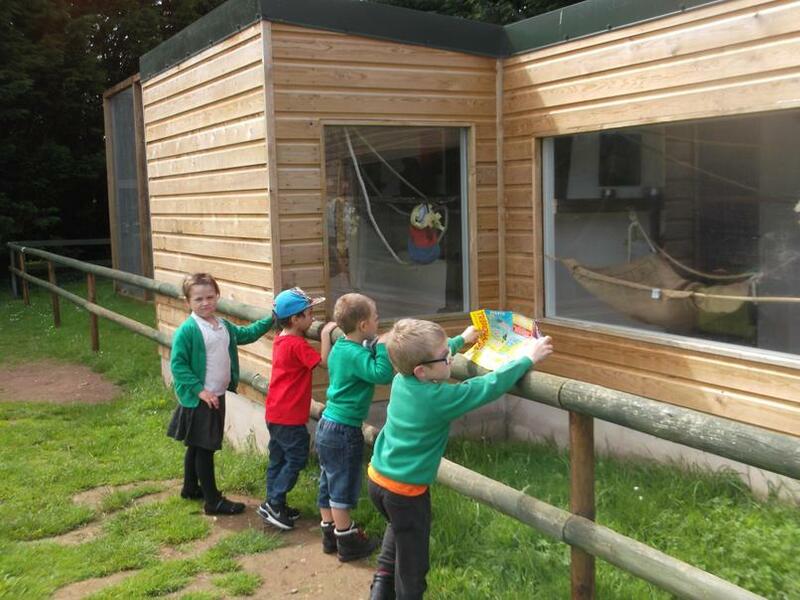 We made a Giant's castle for our big display board - please come to look at it if you can. 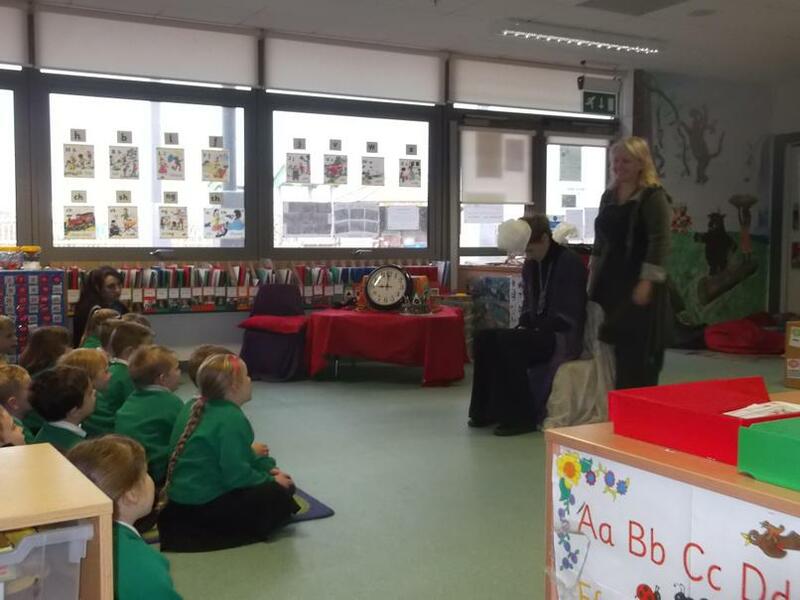 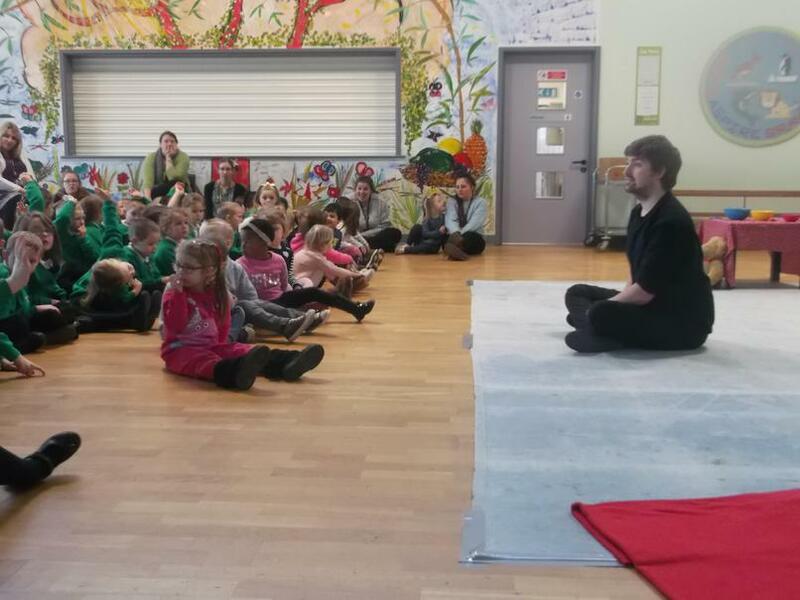 All of the children had an amazing time at our Storytelling workshop on Monday. 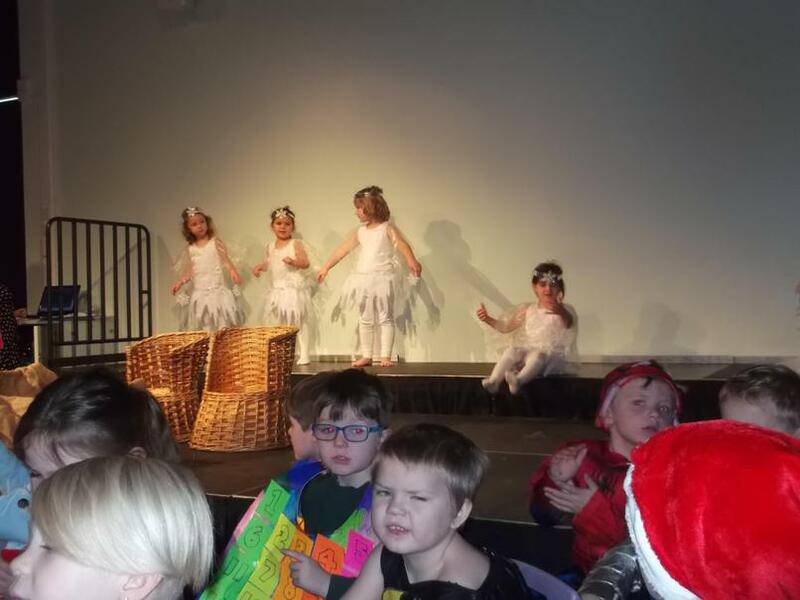 'The Keep 'em Waiting King!' 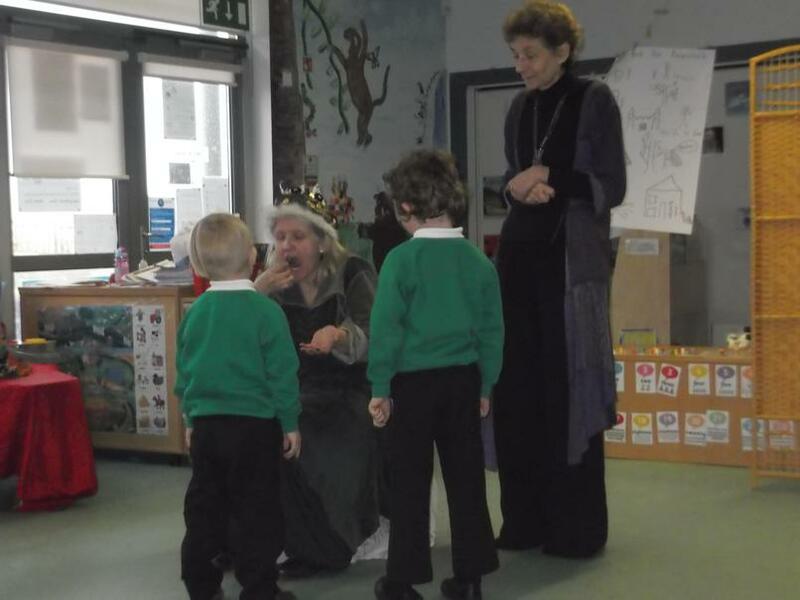 was a great story to learn and we had lots of fun joining in with the Storytellers! 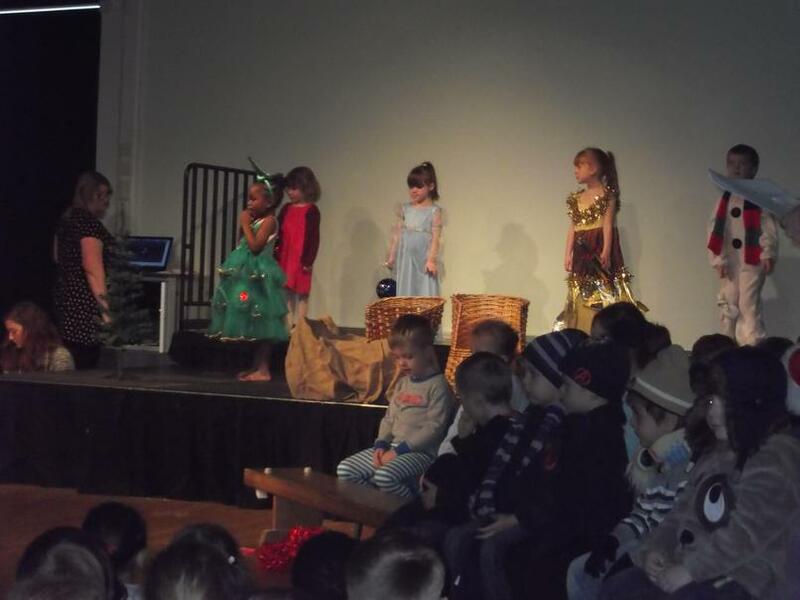 We have had a great time learning our new story 'The Very Hungry Caterpillar'. 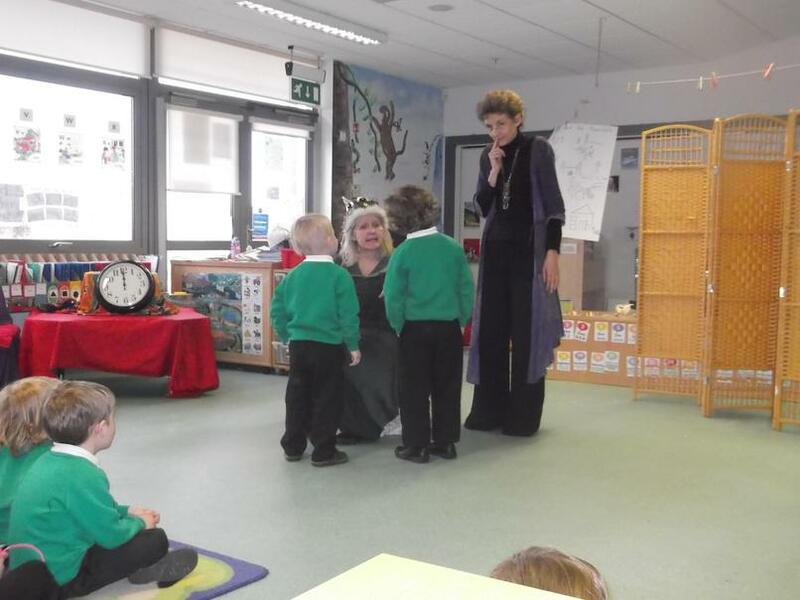 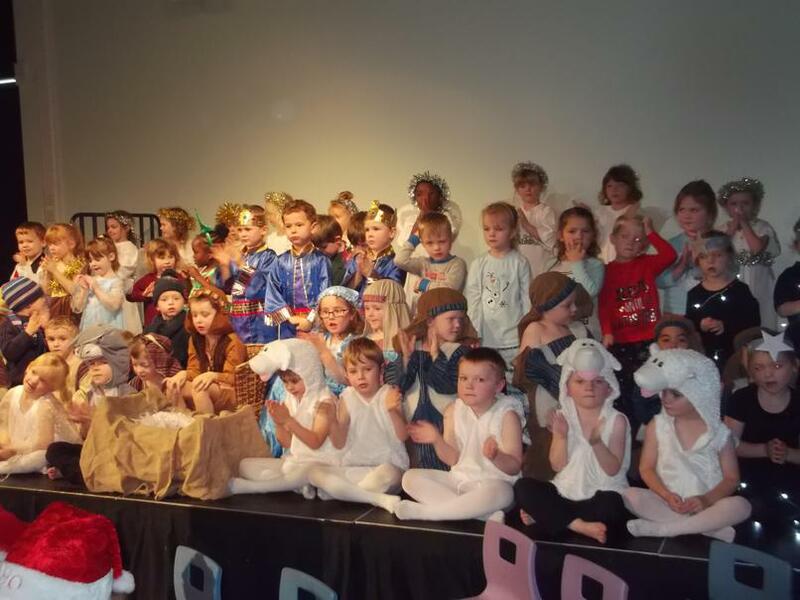 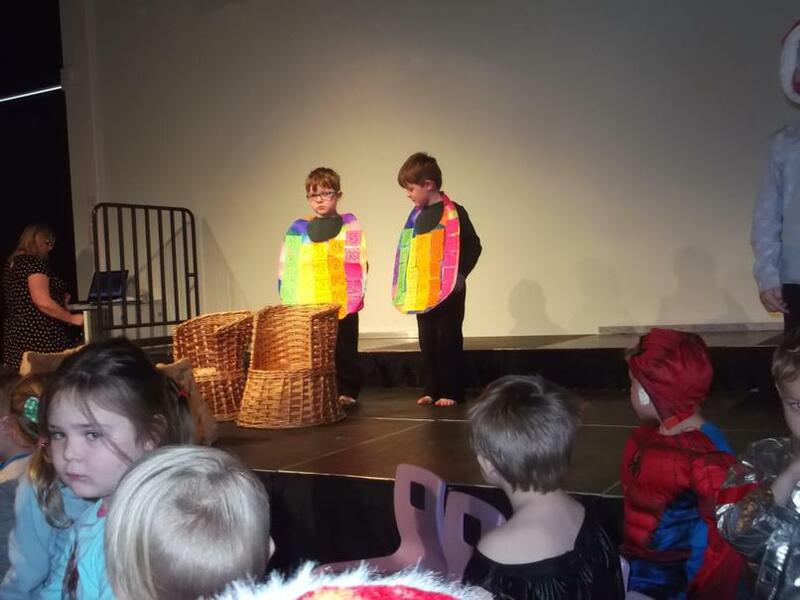 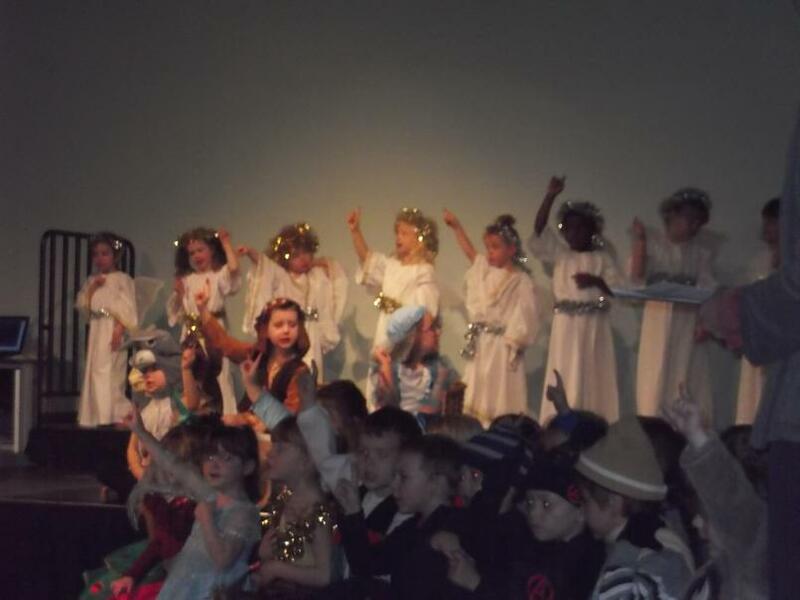 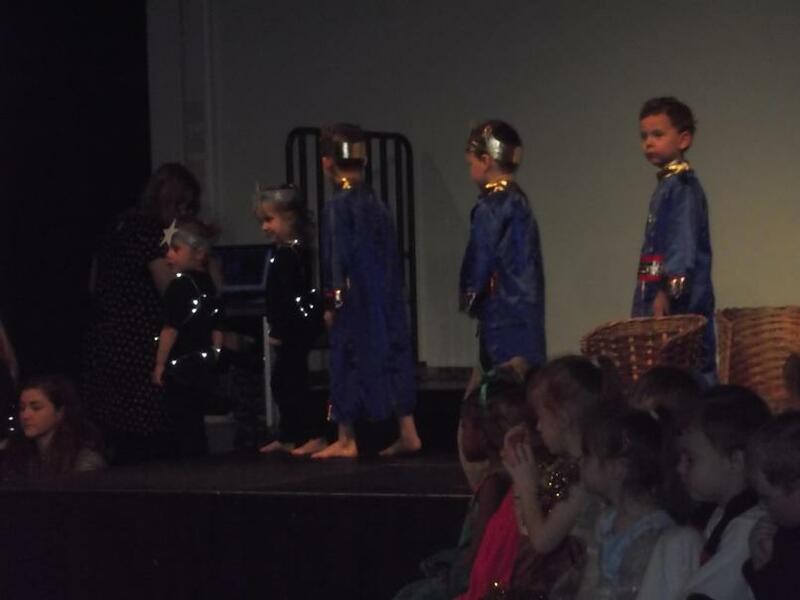 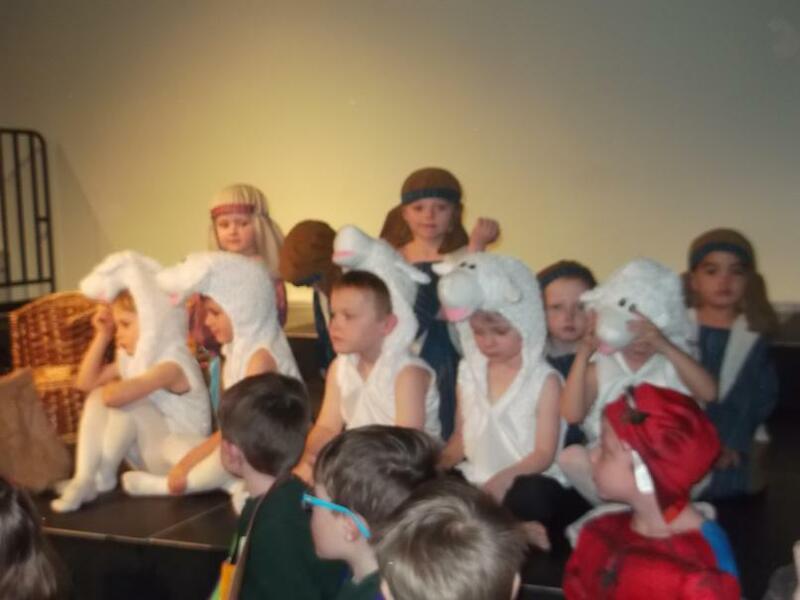 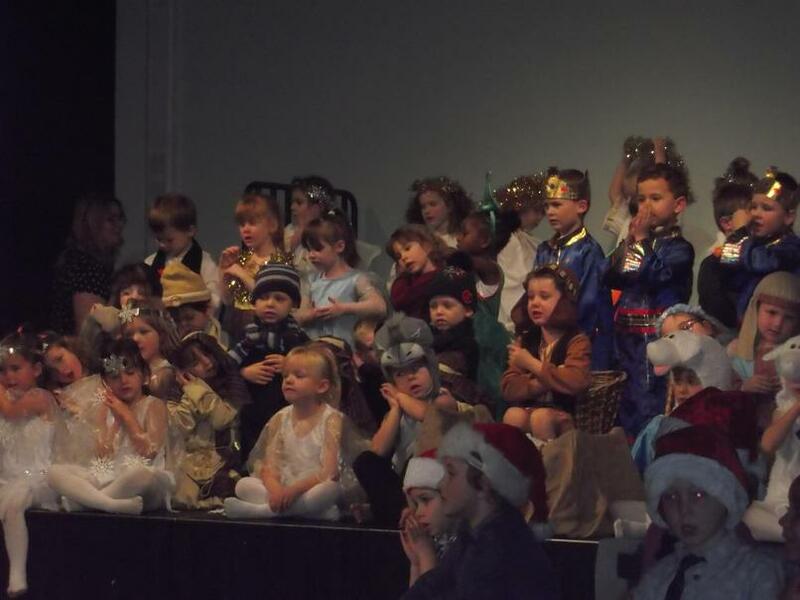 The Nursery children enjoyed it when we told them our story whilst performing the actions. 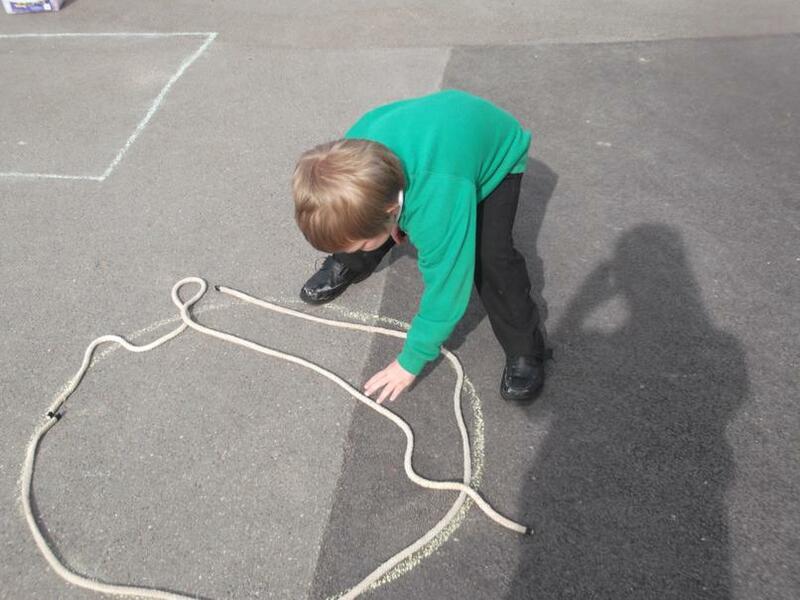 We drew story maps so that we could remember the story to tell our families. 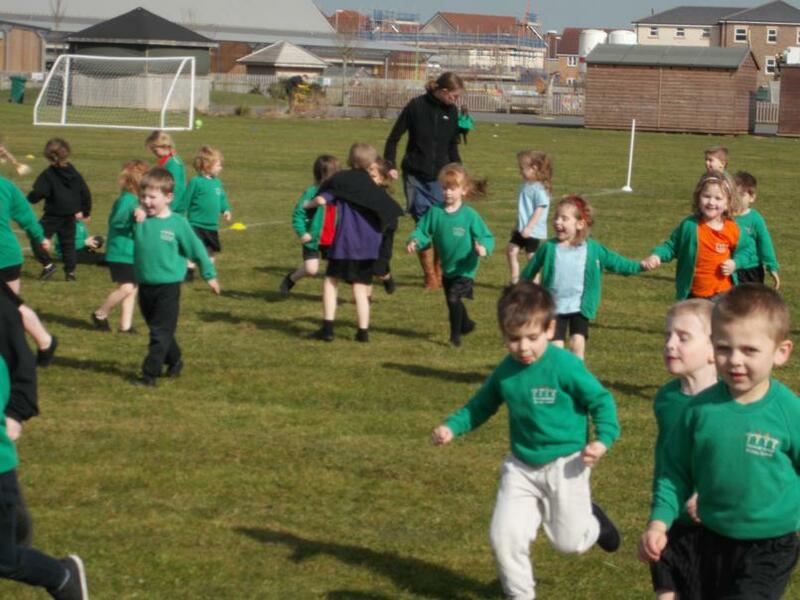 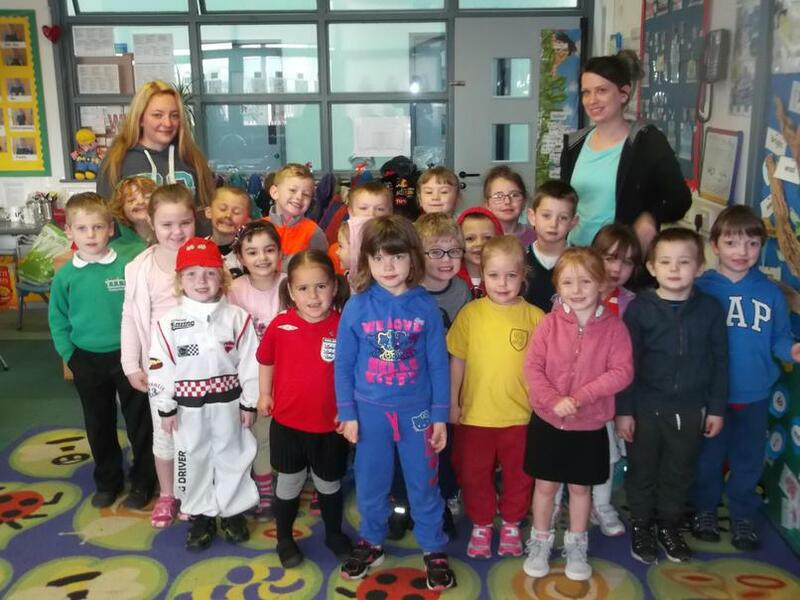 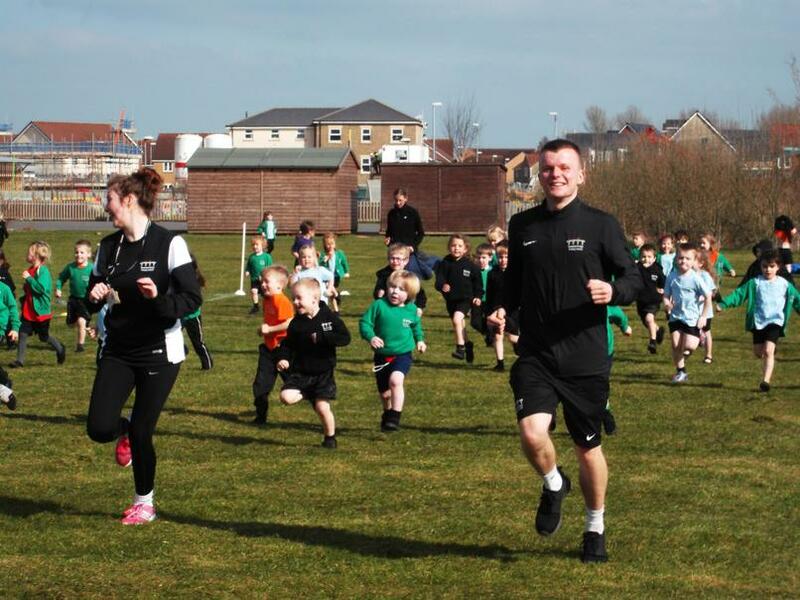 Sports Relief was great fun and we particularly enjoyed coming to school dressed in our sporty clothes! 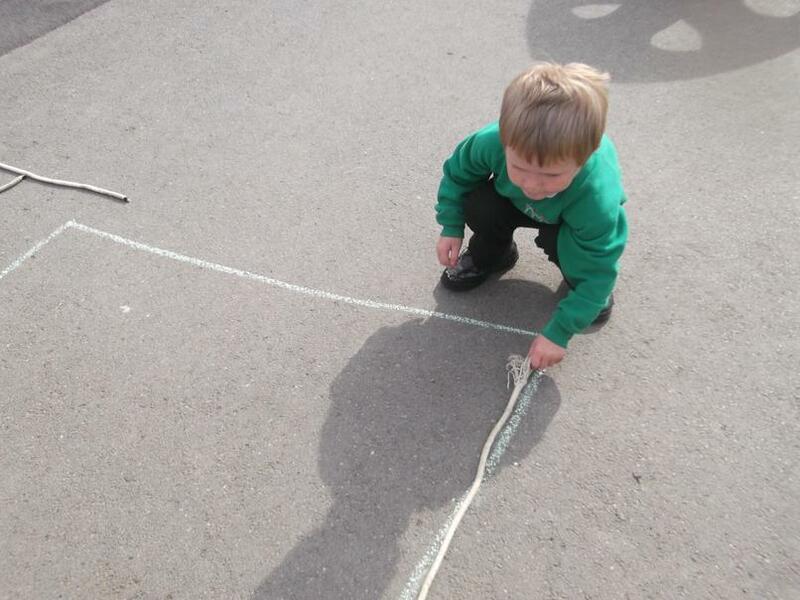 We found lots of insects outside in our garden! 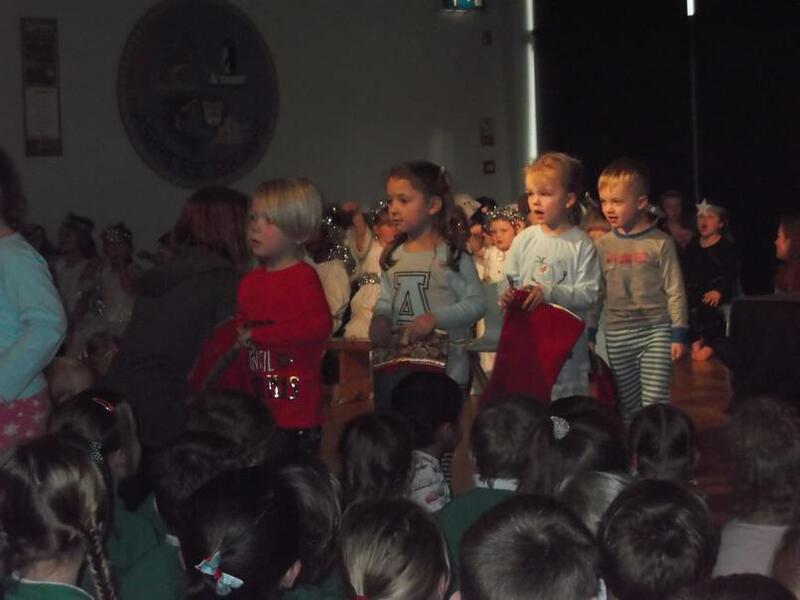 Where is this year going? 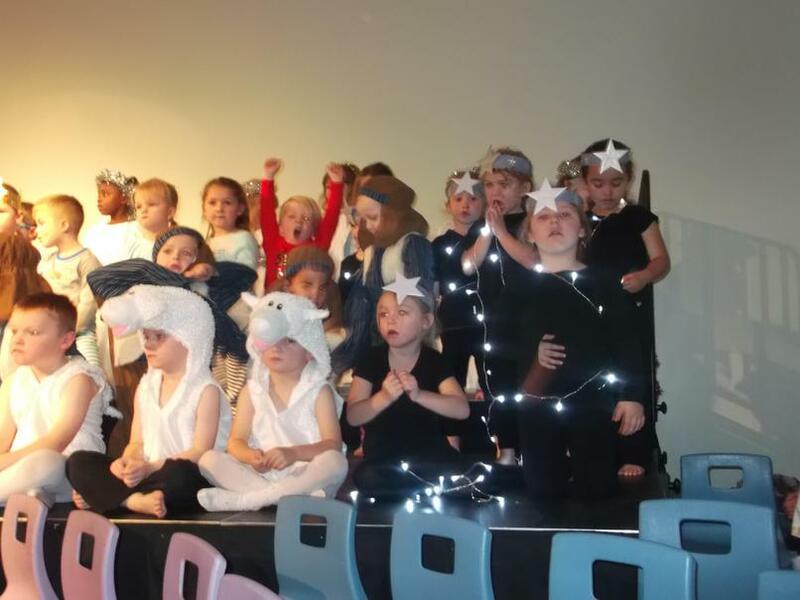 I can't believe we are already in the Summer term and fast approaching the end of the children's first year at school! 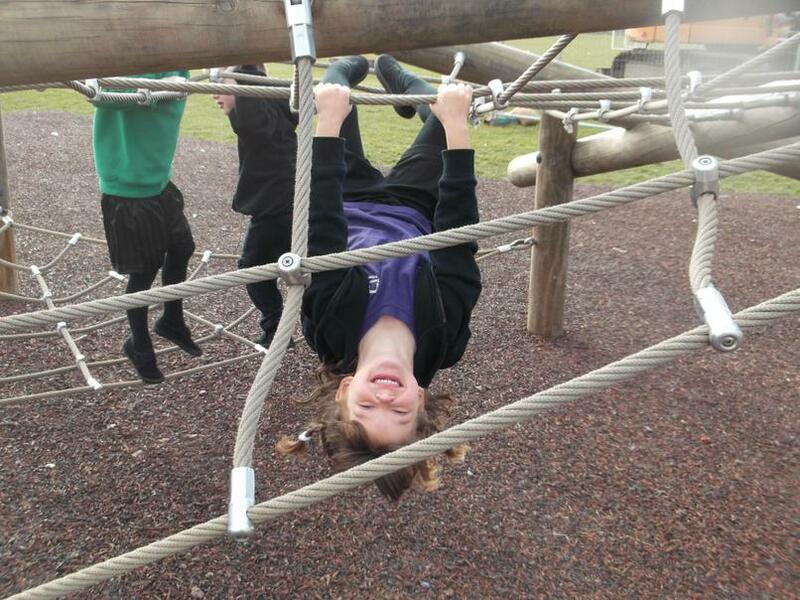 We have once again been very busy learning lots of new things whilst having fun along the way. 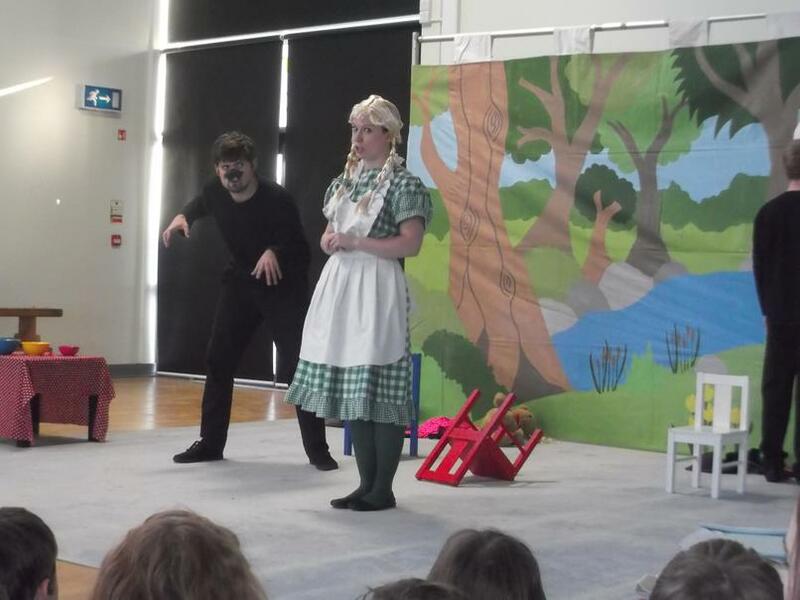 Our new story has been 'Titch' this half term and it has been lovely to see how quickly and confidently the children have learnt this story. 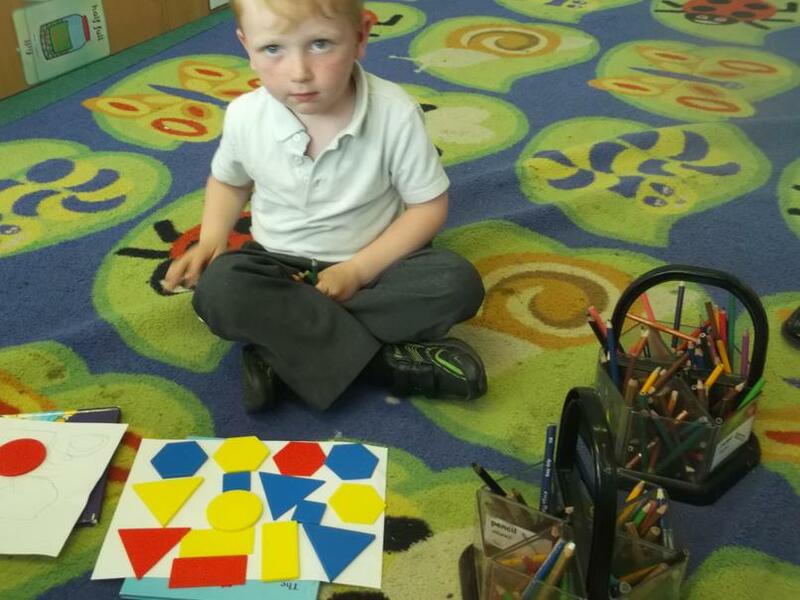 We have also been busy exploring shapes, space and measures with lots of practical exciting activities for the children to enjoy. 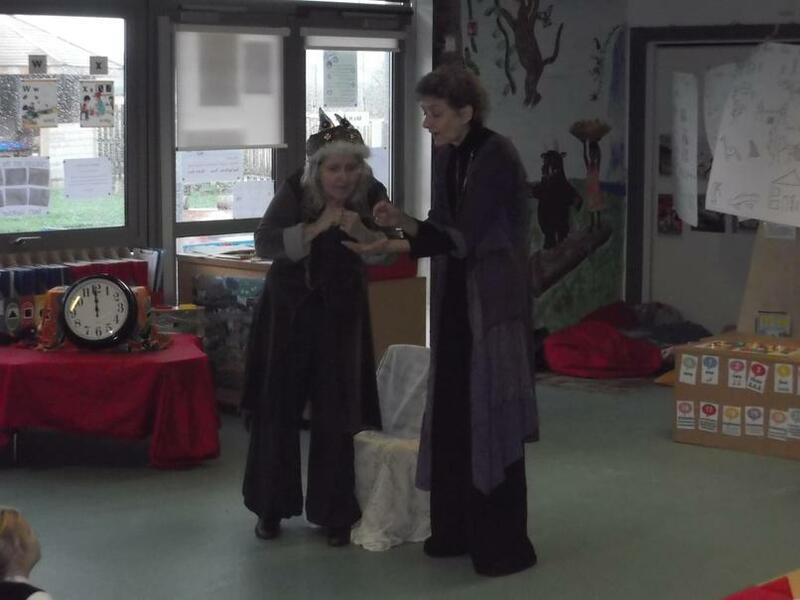 Recently one of our extremely talented mums came into school and played some musical instruments for the children. 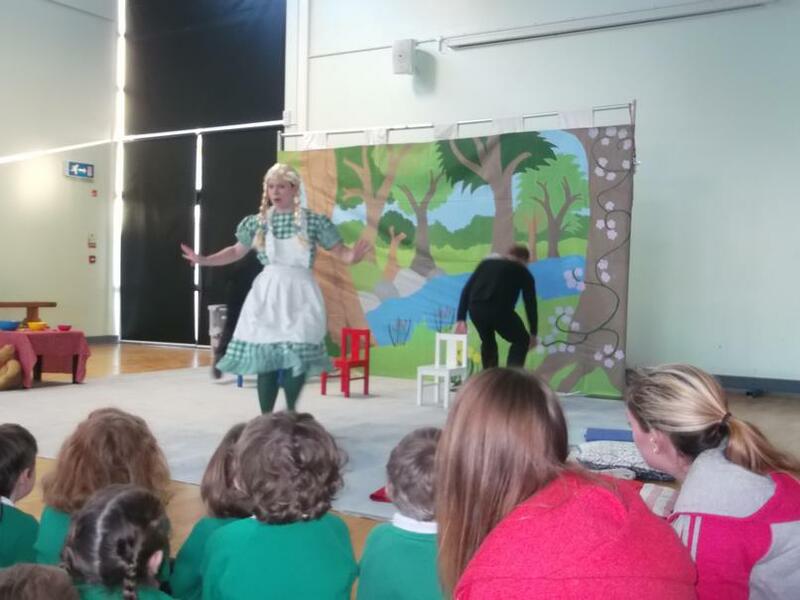 We would like to say a big thank you to her and encourage any other parents with hidden talents to come and share! 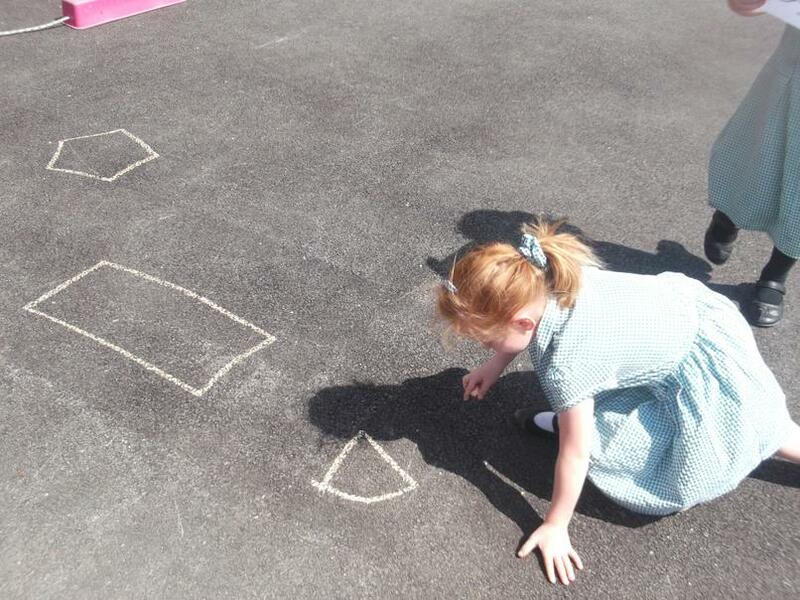 The children had a wonderful time looking for shapes in the Reception garden. 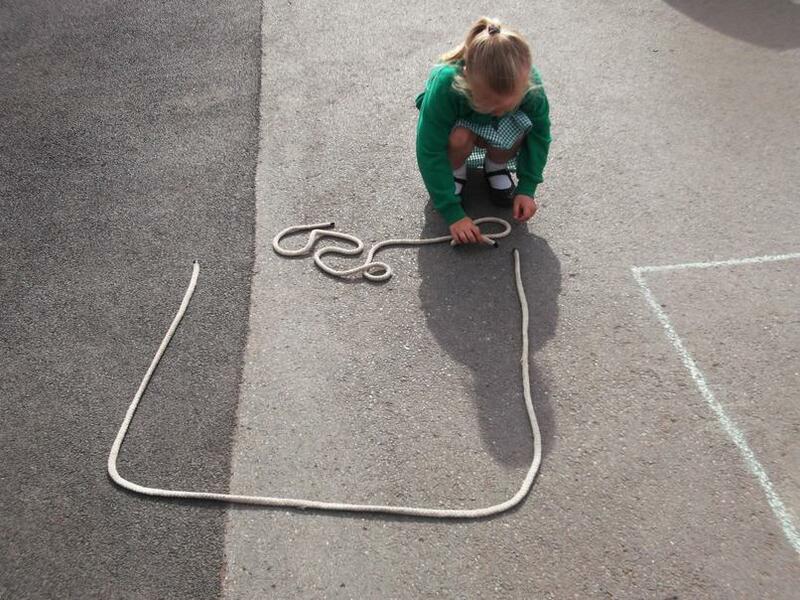 We also drew shapes and made them with skipping ropes. 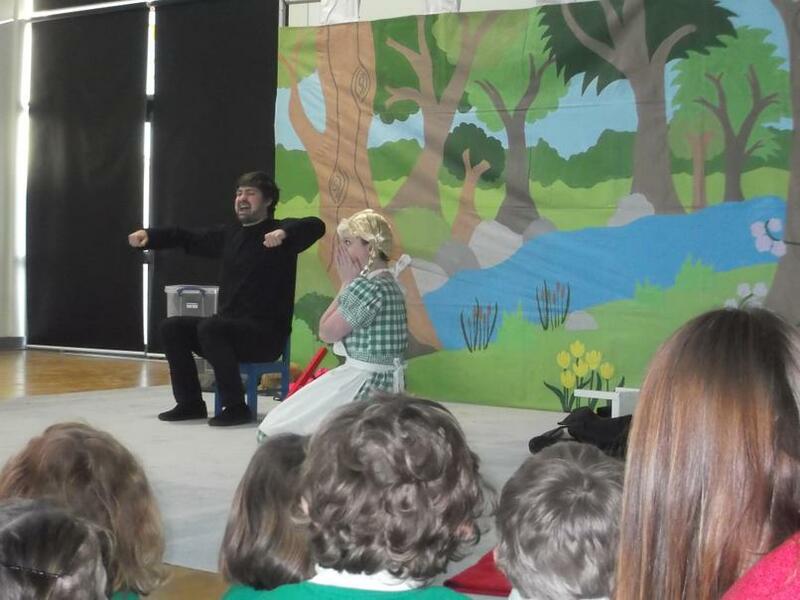 The children loved hearing one of our talented parents play for them! 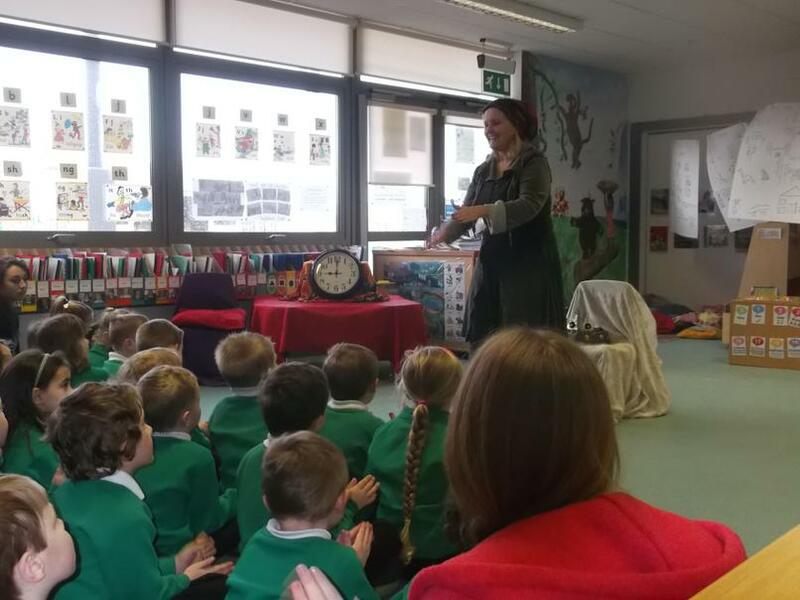 When Naz brought her fascinating animals into class we asked lots of questions about them and found out lots of interesting new things. 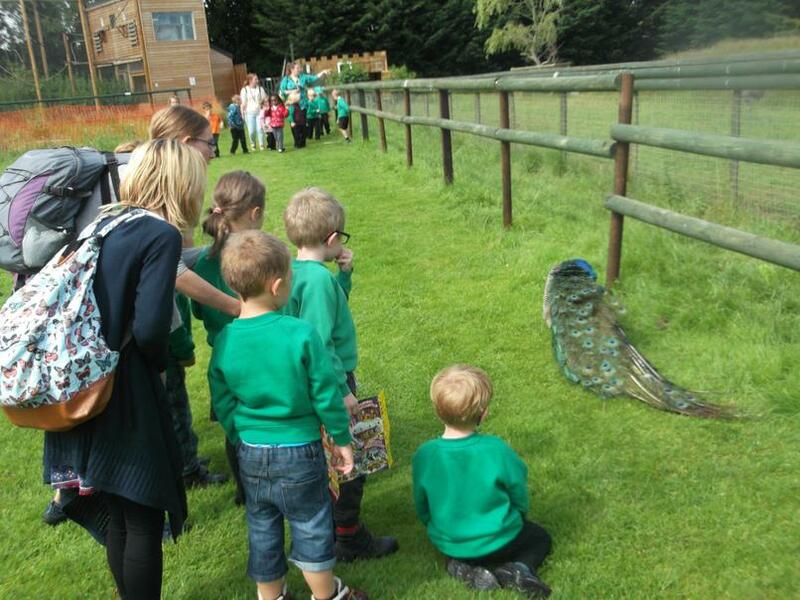 We had a super time at the Tropiquaria in June. 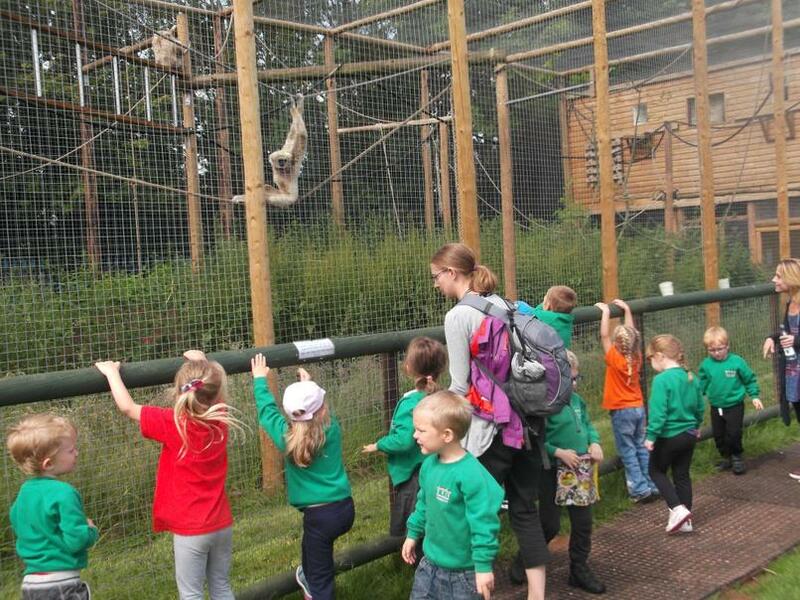 The weather was wonderful, not too sunny but more importantly dry! 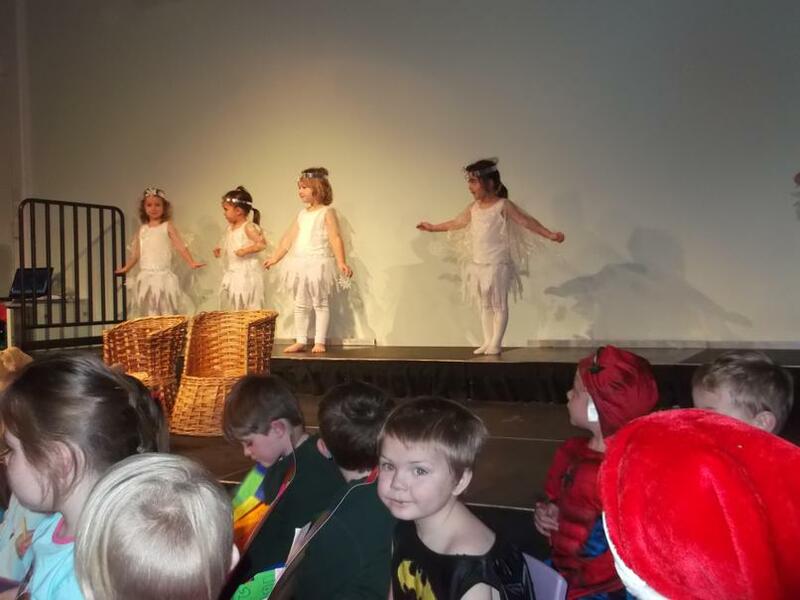 There was so much to see and do! 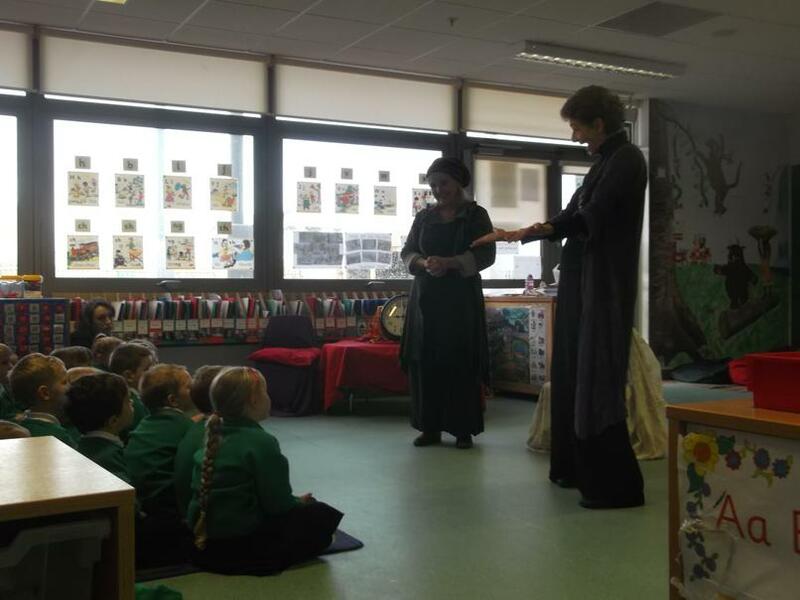 Here are some photographs for you to enjoy but also please look in the Reception classroom windows for more photographs of the things we got up to!